Whether you're a studio owner or a yogi who practices at home on the weekends, the Yoga Direct Striped Traditional Mexican Yoga Blanket is a perfect yoga accessory. Use a yoga blanket as a prop for seated poses, or to cover up for warmth and comfort at the end of yoga class. These blankets are soft and durable, and have a slightly tighter weave than our Traditional Mexican Yoga Blanket. 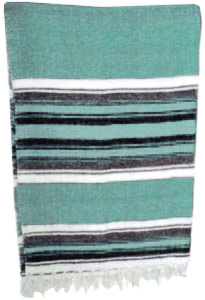 The blankets feature bright, traditional Mexican colors, with white tassels on each end. These beautiful blankets are machine washable. Whether you?re a studio owner or a yogi who practices at home on the weekends, the Yoga Direct Solid Traditional Mexican Yoga Blanket is a perfect yoga accessory. Use a yoga blanket as a prop for seated poses, or to cover up for warmth and comfort at the end of yoga class. These blankets are soft and durable, and have a slightly tighter weave than our Traditional Mexican Yoga Blanket. 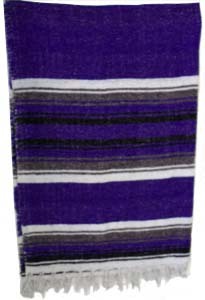 The blankets feature bright, traditional Mexican colors, with white tassels on each end. These beautiful blankets are machine washable. I bought two of these blankets for my home yoga studio (haha actually just my college kid's little-used bedroom),and they're great. Soft, durable, lovely colors. Very high quality for a very good price. This blanket feels great during shivasana, even though it isn't cotton. It has a nice tight weave,compared to most Mexican blankets, and is not so "busy" in its design. Very happy with this purchase! I bought the dark purple blankets. They are soft but sturdy. I recommend them. Nice change from the traditional design. They are soft and the price and service are excellent. This is my second Mexican Blanket from Yoga Direct. I LOVE them. They are like my grow up "blankie". I take one camping when I go. I'm always either covered up with one or I fold them up like a pillow. The quality is great. Mint color was perfect. After washing still looked and felt soft. Met my expectations. Bought 20 of these blankets for my yoga class. They have become a nice addition to the class. Nice looking, not too heavy but bulky enough when folded to support body during poses. Also keeps us warm during savasana. Easy to order and they arrived within days, like two days later! I appreciated this because my class started that week. They are reasonably priced which allowed me to get a class set. Thanks yoga direct! You helped make my yoga class better!